Are you a list maker? I'm a list maker. I make lists before packing for a trip. I make to do lists. I make lists for baby sitters and for any other care giver. If a list can be made, trust me I'll make it. 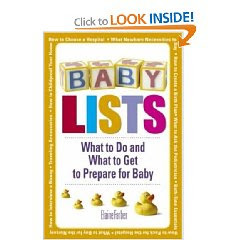 That's why I find Elaine Farber's book Baby Lists: What to Do and What to Get to Prepare for Baby absolutely brilliant. Elaine Farber has compiled all the lists an expectant or brand new parent could ever need. Buying and Packing a Diaper Bag? She's got it. What do you need for bath time? She's got it. Traveling? She's got you covered. I'm not kidding, there's even a list for Baby Keepsakes. I love it! - Every little thing that you might need to worry about or prepare for baby's arrival is contained in this book. - The lists are comprehensive, but clear, and the whole layout is easy to navigate. - Each item has the website listed next to it so you don't have to waste time searching online. - Handy Shopping Appendix with a detailed list of websites where you can shop to your heart's content. - If you're not a list maker this is really not the book for you. - I kept wishing that the book would go one step further and include key lists that you need on hand after the baby arrives - fever chart, over the counter medication chart, Toddler feeding needs, etc. But since the book is subtitled "What to DO and What to Get to Prepare for Baby" I might have been expecting too much. Bottom line: Great book for Type-A expectant parents. Buy it for yourself, buy it for your friend, and then make sure you cross that off your to do list!